Drain olives. Cut block of cheese horizontally into 2 pieces, each about 1/2 inch thick. Cut cheese with 1-inch star-shape canapé cutter. Cover cheese stars with plastic wrap. 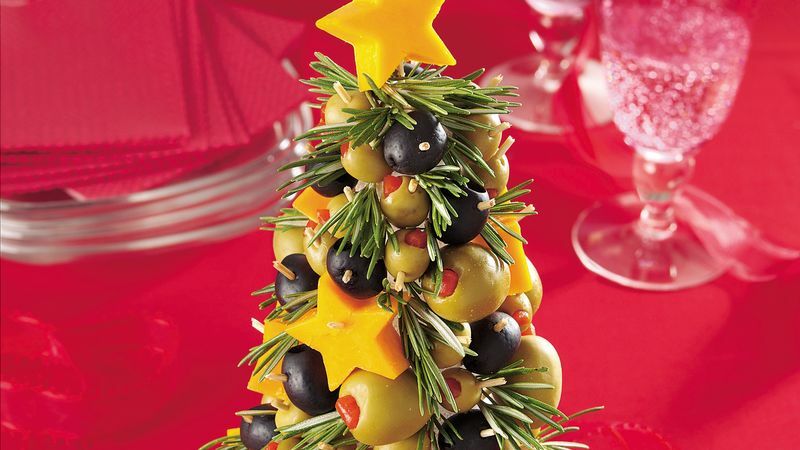 Push each cheese star onto toothpick half; insert into cone among the olives. Top tree with a cheese star that has been inserted horizontally on toothpick between points of star. Insert rosemary sprigs randomly between olives and cheese. Cover loosely and refrigerate no longer than 8 hours before serving. Make this easy appetizer the star of your party. Look for the cone floral foam at craft stores.